Rounding out our wellness services is our fully equipped fitness center, where we provide instructor-led workout sessions, youth fitness classes, individual physical training, and more! Home to Ohana Weight Loss Challenge, Ohana Fitness Center serves as the hub of our community wellness programs. Training with certified instructors in a fully equipped fitness center and small classes offers you custom training sessions for the price of a group session. Prefer to work out on your own? No problem, we’ve got you covered! Are you an Ohana customer? We have a sweet deal for you! For $10 a month, or $99 for the year, you can enjoy the benefits of unlimited access to the gym. Work out on your own or hop into a group workout class. Access the gym when your schedule allows, it will be available during our regular business hours. Click HERE to sign up for the $10/ Month deal, or if you prefer the annual deal, click HERE. That’s a savings of more than 17%! Not a customer of Ohana? No worries, we are offering the same sweet annual deal of $99 for the year. If you prefer not to commit to the annual plan, our monthly plan is $25 for non-Ohana customers. Click HERE for the $25/month plan, or HERE for the $99/Annual deal! Each monthly plan is subject to a six-month minimum recurring membership. Annual memberships are due at the time of registration. T.R.O.Y. Fitness Challenge is a 4-week youth fitness program by the Ohana Family Foundation in which kids not only pledge to adopt a healthy, active, and energized lifestyle but also are given the expert physical training, nutrition information, and motivational support to follow through. Stay tuned for the next T.R.O.Y. Fitness Challenge! Coach Mike has dedicated 10 years of service in the field of health and wellness. Having an array of certifications in NASM (National Academy of Sports Medicine), First Aid/CPR, USA Track & Field (L1), USA Weight Lifting (L1), massage therapy and rehabilitation, his passion is to help people heal their bodies physically, mentally, and spiritually, and uses his expertise to do just that. 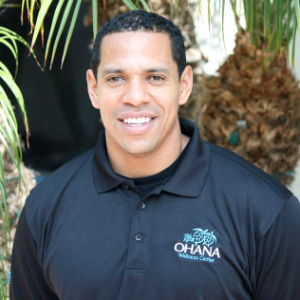 Coach Mike wears many hats here at Ohana, specializing in the areas of sports rehabilitation, personal training, group training, sports performance, strength and conditioning, and massage therapy.